CNN speaks with Fareed Zakaria about the alleged shooting down of Malaysian Airlines Flight 17 in eastern Ukraine on Thursday. This is an edited version of the transcript. The conflict in Ukraine had generally slipped out of the headlines in the United States, but Thursday’s incident was a very shocking reminder that if anything it as intense as ever. I think it's also a reminder of something else – that the government of Ukraine doesn’t actually control all of the territory of Ukraine – this happened in a part of Ukraine that the government of Ukraine doesn’t control. It’s largely controlled by these pro-Russian rebel forces. Some are Ukrainians, but there was a lot of reporting as you know that says there were a lot of Russians and Russian special ops people who've been in there. Actually, Ukraine’s government accuses the separatists and Russia of being linked in that way. Precisely. And a lot of the equipment that those separatists have got they almost certainly got from Russia. This should be an opportunity for the entire world for the West, for the United States, to say, let's end this farce once and for all. The government of Ukraine has to have control over its own territory. The Ukrainian army should go in there, clean this out, and the Russian government at this point I think is on the back foot and won’t be able to try mounting any spirited defense. Since a new president was elected in Kiev we’ve seen advances by Ukrainian forces against separatists. Early on, when Ukraine's military was trying to move into some of these regions in eastern Ukraine, they basically got turned around by mobs of people. But there have been some advances by the Ukrainian military there in the last several weeks. Exactly, and part of that is they're getting their act together. Part of it, remember, is the Ukrainian military and intelligence services are riddled with Russian spies, so that has made it very difficult. But this is all an opportunity to clean that up, to allow the government of Ukraine to have control over its territory, to sweep out some of those Russian forces. This would be an opportunity, particularly if the Europeans really lay it on the line, because Putin is going to feel on the defensive here. This wouldn’t be a time to mount a Russian counter offense. 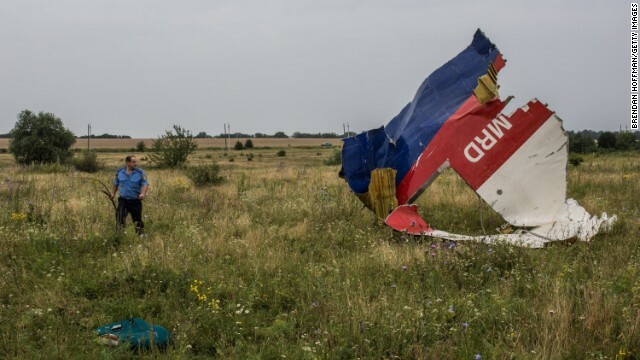 A U.S. official told CNN that the Obama administration doesn’t think the government of Ukraine has air defenses in the region where Malaysian Airlines Flight 17 was shot and crashed. The official also told CNN that we'll see the Obama administration attempting to internationalize this, and there will be pressure to allow others from outside to see this site. What do you make of that? I think it's actually very important because we forget that in Russia that what people are hearing is a completely different narrative. You heard Putin basically saying “Look, if the Ukrainian military wasn't trying to take control of their own country, none of this would happen because this area wouldn't be a war zone.” And there are reports in Russia that say that this was the Ukrainian military that shot down the plane because it was trying to shoot down Vladimir Putin's plane and that they missed and that these two planes just happened to be in the sky at the same time. The Russians have had this extraordinary propaganda offensive throughout this Ukrainian crisis – there have been some bald faced lies, they’ve made stuff up and just put it out there. "they have made stuff up and just put it out there"....lol as if US government hasn't done that behind every single conflict on this planet through its biggest mouthpiece which is CNN. Did we care when the US Navy shot down an Iranian airline. Iran Air Flight 655 was an Iran Air civilian passenger flight from Tehran to Dubai that was shot down by the United States Navy guided missile cruiser USS Vincennes on 3 July 1988. The attack took place in Iranian airspace, over Iran's territorial waters in the Persian Gulf, and on the flight's usual flight path. The aircraft, an Airbus A300 B2-203, was destroyed by SM-2MR surface-to-air missiles fired from the Vincennes. All 290 on board, including 66 children and 16 crew, died. This attack ranks tenth among the deadliest disasters in aviation history. The US paid compensation to Iran for that. You think Russia will pay for this one? Well! We PAID for it with some money we have! We shot down a plane while enforcing our empire, but we paid for it – with money! We also pay families in Afghanistan a few thousand dollars after we blow up their kids at a wedding! Amazing! We're saints! That doesn't make any sense. It doesn't negate the fact that it they are doing it. The farce will end soon: Ukraine's government (a gang of oligarhs and politicians who usurped the power in February) started to fall apart. Yazenuk decided to take his share and quit the company first. I presdicted that back in early spring. It looks like American tax-payers money is running out. Meanwhile Russia will be cleaning a mess created by USA. Please do not panic when Ukraniane army is kicked out from Eastern Ukraine. This has to happen by all historical logic. Why isn't anyone asking the Ukrainian government for compensation? They KNEW their airspace was not safe. Yet they happily cleared numerous commercial flights, perhaps thinking they would be a useful shield from rebel missiles. When any responsible government with a conscience or any commonly decently human being would have warned innocent bystanders to stay away. Are they not equally culpable? Are they really fit to government. Please CNN, ask them to explain themselves!!! When one reads a journal filled with advertisements, beautiful photography and some good writing are enjoyable in spite of an intention to persuade the reader to think a certain way, or to purchase goods. Advertising makes journalistic publication economically feasible. We are whiter than snow. An example of brainwashing is USA citizens' thinking that Muslims are bad because they don't "do the Christian thing." Time to end the farce that is Putin. The Russian people should take their country back from this soviet era loser. Spoken like another Tea Partying grade school dropout. Thank you, Ted. We already have enough ignorant people here spewing out their stupidity as it is! I agree with you, Ted! @ Ted, hopefully the people of Russia will realise that because up til now theyve been pretty afraid of him. And with justification as it turns out. So if someone commits murder:. Who goes to prison? Person who commits murder or owner of the gun shop, where gun was bought? Both, if the gunshop owner encourages the buyer to murder. This Zakaria guy blames Russia of "propaganda offensive" and "making stuff up", when he was making just the same several paragraphs before – spurting on accusations of warfare supply without having at least one hard-headed, evidence based proof. And people like you are actually eating it and asking for more. I don't even know if it's hilarious or appalling. At last, a voice of reason! Stephen Cohen pointed to the massive elephant in the MH 17 room the CNN has quite frankly,ignored. I might even start watching CNN again, if he's likely to be given more air time. What voice of reason are referring to? Mr. Cohen selectively uses information to make his point, ignoring the vast body of evidence and facts that would negate his argument. His reasoning and logic is built on half truths and misinterpretations. Is Mr. Cohen a Putin cheerleader? What is his agenda? @ Joseph if you think Putin is so freaking awesome why havent you moved to Russia by now??? We are now being shown videos of arms, military might & Russian soldiers crossing into Ukraine for at least the last month,. And what has the E.U., in particular, & Obama done. ?...Virtually nothing. The lack of resolve by Merkel, Hollande, & Cameron, is sickening & disgusting. They are to blame as much as Putin for the missile murders of civilians Where is there an Iron Lady & a Reagan when we need them? .Certainly not in this gutless, leaderless bunch. Has Putin paid this bunch off as well? There always at least two sides of the same History! Ukraine was an invention of the communists that joined two provinces, the Little Russia (Ruthenian speaking) and Novorossya (Russian speaking), a Frankenstein like the former Yugoslavia The people of Novarossya endured the Golomodor (famine) and now endure the massacre perpetrated by the West! Probably they mistakenly shot down the plane o the Malaisian Airlines, a tragedy! But the West is responsible for letting the Soviet style massacre by Western Ukraine on the Novorosyans and this is what Russian people is against! Apparently you have no idea what you are talking about. GB, Germany, France and actually all European NATO allies are leading US into a dead trap. Do you really think that any of those countries would dear to attack Russia militarily? The old European boys would once again lead the big fat young bully into the trap. The same trap every great invader of Europe had suffered. I would not be surprised if there isn't already a pact behind the scenes, ......how US to be divided after the WWIII. Maybe that is the reason for Putin's boldness and ignorance. Or maybe you thought that the $ would rule forever???......Utopia??? Imagine the raw Russian sentiments if Flemish separatists would down a commercial Tupolev with 200 Russian compatriots. We tend to forget that Dostojevski, Tolstoi and Gorki were not born in Donetsk. It is appalling and frightening to be confronted with such lack of civilization so close to the heart of Europe. Thanks for your reporting and insight on the terrorist attack on flight MH-17. I watched intently today (Sunday and Friday last week) and was heartened to hear your perspective on what is going on in Ukraine. You appear to have a very good handle of the situation and are not afraid to speak openly and honestly. Thank-You for being well informed and sharing your perspectives. A little later in Sunday's show CNN interviewed Prof. Cohen and a Cdn politician. Mr Cohen speaks in half truths and misinformation. His manipulation of facts create a lie. That he neglected to mention that the 10 day unilateral cease fire on the side of Ukraine was used by the Russian terrorists to be re-armed by Russia and violate the cease fire by attacking Ukrainian positions up to 100 times makes his statements essentially a sin of omission. Further some of his other past stories of Russia's war on Ukraine can't help but make me believe that Mr. Cohen is a Putin apologist, Also to start a discussion with Mr Cohen's half truths and close with Mr Cohens selective facts demonstrates that this news piece wasn't a serious discussion. It appears to be a soap box for Mr Cohen. In the future CCN please make the effort to use objective and honest guests, not people who push their own agenda, whatever it may be. Mr. Cohen, may be well educated, and well read, he is not however honourable, truthful, nor respectable. In a way giving air time to Mr Cohen, lessens the overall credibility of CNN. This hi-tech act of belligerence may be an omen that the severe budget cuts on European military will prove to be a historic act of governmental negligence. The spoilt European taxpayer needs to realize that without a unified, strong, modern and versatile army, their societal systems are to weak to withstand the islamic primitivism from within and the Russian primitivism from outside. Zacaria appears to be saying that we should give Putin a free hand to deal with Ukraine. That was the advice that cost Poland forty five years of slavery under the Stalin"s boot! Fareed, I thought you are an independent thinker (at least I've been watching you on CNN for a long time) but you are spewing a US propaganda in this article...and where are all these CNN international correspondents in E.Ukraine....no one to be found....and hundreds of civilians got killed (more than in Gaza now by the way) ...everything on CNN website re-printed from Kiev Junta and US propaganda....and we are thinking media in our country (USA) is free from government...think again....what happened to CNN and other media is unbelievable....it is worse than in Soviet Union and believe me I lived there before I know. Lets assume the worst role by Russia. Ie they were involved in accidentally shooting down MH17. US eventually paid $69M compensation when they shot down the Iranian plane, they honoured the officers who did it and continued to deny responsibility. Lets adjust for inflation and send the bill to Putin, but admit that this was a tragic accident in a warzone. This tension was provoked by the west, and is much closer to Russian territory, than the Iranian flight was to US territory. Given the US animosity towards Iran it is much more likely that it was deliberate than that Russia deliberately targeted a malasian flight from Holland. Tragedies happen in conflicts and the West provoked this conflict. it is the EU and the US that needs to back of in their attempt to annex Ukraine. Читать дальше – все тайны и факты! На сайте действительно информация про все и всех. Я сама была поражена, откуда они все знают??? Merely wanna comment that you have a very nice web site, I enjoy the style and design it actually stands out.